There are five main species of Plasmodium, namely Plasmodium vivax, Plasmodium knowlesi, Plasmodium ovale and Plasmodium malariae and Plasmodium falciparum (P. falciparum). Among them P. falciparum is the most widespread and is considered to be deadly since it causes fatal complications,,,. According to WHO report, in 2015, nearly 438 000 malaria deaths occurred worldwide due to P. falciparum. One of the major obstacles in fighting malaria is “drug-resistance”. Plasmodium species have gained resistance to artemisinin, which was introduced in 1971 as an antimalarial drug. The first case of resistance was reported in 1980. Most antimalarial drugs like quinine and artemisinin were developed on the basis of serendipitous discovery of the antimalarial activity of natural products. About 80% of the world’s population still rely on herbal drugs for their health care. Since ancient ages, humans have been looking forward to nature to cater to their basic needs, especially medicines. Most of the potential drug leads are plant-based. Natural products play a key role in the production of bioactive molecules and pharmaceutical agents. The first written records on utilization of plants in medicine date back to 2600 BC. Plant metabolites can provide us with novel lead compounds which can be used as template to develop antimalarial drugs. Bearing these points in mind, the plethora of phytochemical constituents present in plant extract can be used to test the potency against P. falciparum. Plants were randomly selected for antimalarial property, some decades ago. This approach seemed time consuming. An alternative approach is to select plants based on their ethnobotanical and ethnopharmacological information,,,. Therefore, the present work attempts to identify and characterize a novel antimalarial substance from plants, based on the traditional use of plants. Based on ethnobotanical literature survey, plants which possessed antipyretic and antimalarial properties were targeted. Nine such plants were selected and authenticated by Dr. A.S. Reddy, P. G. Department of Biosciences, Sardar Patel University. The same were also checked at www.theplantlist.org. The plants parts of Mangifera indica (M. indica) L. belonging to the family Anacardiaceae, Aegle marmelos (A. marmelos) L. Correa belonging to the family Rutaceae, Ficus religiosa (F. religiosa) L belonging to the family Moraceae and Moringa oleifera (M. oleifera) Lam. belonging to the family Moringaceae, were collected from the same location (GPS location 22°34’11.6”N 72°54’34.1”E). Acalypha indica (A. indica) L from the family Euphorbiaceae was collected from the location 22°34’14.0”N 72°54’42.0”E, Hyptis suaveolens L. Poit. from the family Lamiaceae was collected from the location 22°33’42.5”N 72°55’44.3”E. Ficus racemosa (F. racemosa) L. belonging to the family Moraceae and Averrhoa bilimbi (A. bilimbi) L. belonging to the family Oxalidaceae were collected from the location 22°34’16.8”N 72°54’41.9”E and 20°16’15.5”N 73°00’22.6”E, respectively. The voucher specimen number of the collected plant samples are as follows: M. indica (PGBRM01), A. marmelos (fruit) (PGBRM02), F. religiosa (PGBRM03), A. indica (PGBRM04), M. oleifera (PGBRM05), H. suaveolens (PGBRM06), F. racemosa (PGBRM07), A. marmelos (leaf) (PGBRM02) and A. bilimbi (PGBRM08). Fresh plants were washed under running tap water and kept for shade drying for 7–10 d. After drying, the plant parts were pulverized to fine powder and stored in air tight containers for further analysis. The plant powder was defatted using petroleum ether (60-80 °C) and kept at 37 °C under continuous shaking condition. The marc was then extracted with distilled water: methanol (70:30) in soxhlet extractor at 50 °C till the colour turned colourless in the siphon. The extract was first concentrated using a rotary evaporator under reduced pressure of 22-26 mmHg at 50 °C. When kept at steady state, the concentrated extract deposited crystals. The yield was collected and stored at 4 °C . The hydroalcoholic extracts of the samples were screened for various phytochemical constituents, using standard methods. They were analyzed for the presence of alkaloids, phenols, glycosides, flavonoids, tannins, saponins, steroids and triterpenoids. HPTLC is considered to be the best approach to separate phytocomponents. The crude plant extracts were dissolved in hydroalcohol (70:30) and 7 μL quantity of sample was applied onto the HPTLC plate, silica gel 60F254 using CAMAG Linomat 5 injector. Camag twin-trough chamber was formerly saturated with the mobile phase ethylacetate: methanol: water (81:11:8) for 30 min and then the plate was kept for development. Plates were scanned at 366 nm with tungsten lamp using Camag Scanner III in combination with winCATS III software. The chromatographic finger print was developed for the detection of phytoconstituents present in the plant extracts and their Rf values were tabularized. Chloroquine-sensitive (3D7), the chloroquine-sensitive strain of P. falciparum, obtained from NIMR, New Delhi, was used to test the antimalarial efficacy of the nine plant extracts. The in-vitro percentage inhibition of entry of parasites was determined by the method used by Jonvile et al, with slight modification. Assays were performed in sterile 96-well microtiter plates. Normal RBCs were treated with the plant extracts and exposed to infected RBCs with 2% parasitaemia for 24 h in CO2 incubator. Normal RBCs without any kind of treatment were considered as control. The counting of number of schizonts in the control and treated samples was performed by making thin smear and staining them with JSB- I and JSB- II. The results were validated microscopically under 100× and the values were expressed as percent inhibition of entry of parasites. The 50% inhibitory concentration (IC50) was determined. The preliminary phytochemical screening revealed the presence of potent phytochemicals in the crude plant extracts. The investigated plants showed the presence of the following phytocomponents in the order of flavonoids > tannins, phenols > steroids and triterpenoids > glycosides > saponins. Flavonoids were detected in all the extracts. Hyptis suaveolens (H. suaveolens) (IC50: 3.906 μg/ mL) and M. indica (IC50: 4.150 μg/mL)showed the presence of triterpenoids [Table 1]. Table 1: Preliminary qualitative analysis. HPTLC separation of the crude extracts showed a number of phytochemicals, with M. indica having the highest number of compounds and A. bilimbi showing the least number of compounds [Figure 1]. 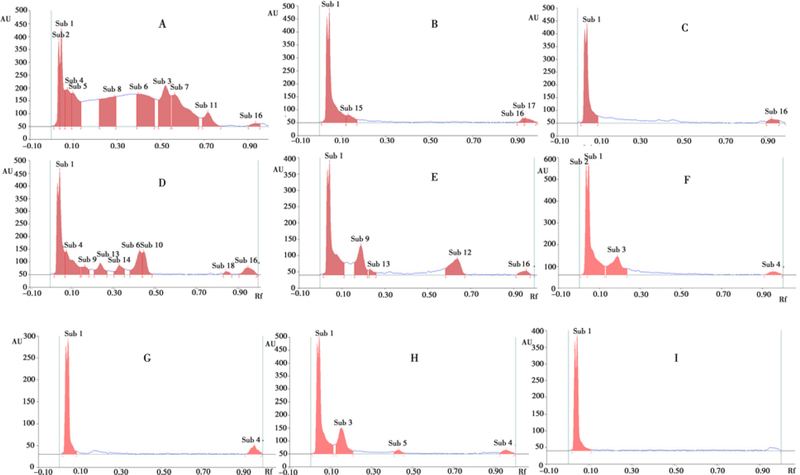 The chromatograms of all the extracts were scanned at 366 nm The crude extracts of M. indica, A. marmelos (fruit), F. religiosa, A. indica, M. oleifera, H. suaveolens, F. racemosa, A. marmelos (leaf) and A. bilimbi revealed the presence of 9, 4, 2, 9, 5, 2, 4 and 1 substance/s respectively. The results of the scan were shown in [Figure 2]. Figure 1: Chromatogram under UV- 366 nm. Lane 1: M. indica, Lane 2: A. marmelos fruit, Lane 3: F. religiosa, Lane 4: A. indica, Lane 5: M. oleifera, Lane 6: H. suaveolens, Lane 7: F. racemosa, Lane 8: A. marmelos leaf and Lane 9: A. bilimbi. Figure 2: Chromatograms scanned at 366 nm with tungsten lamp using Camag Scanner III in combination with winCATS III software (Version 1.4.6.8121). A: Extract of M. indica, B: Extract of A. marmelos fruit, C: Extract of F. religiosa, D: Extract of A. indica, E: Extract of M. oleifera, F: Extract of H. suaveolens, G: Extract of F. racemosa, H: Extract of A. marmelos leaf, I: Extract of A. bilimbi. Sub: Substance. After checking the antiplasmodial activity of the plant extracts, IC50 value was calculated. The least IC50 was exhibited by M. oleifera (IC50: 3.906 μg/mL), A. indica (IC50: 3.906 μg/mL), H. suaveolens (IC50: 3.906 μg/mL), followed by M. indica (IC50: 4.150 μg/mL) and A. bilimbi (IC50: 4.881 μg/mL). Based on WHO recommendation, plants possessing IC50 less than 5 μg/mL are considered as excellent. Artemisinin, currently used as antimalarial drug to treat patients suffering from malaria, was used as a standard, which displayed an IC50 value of 3.906 μg/mL. The IC50 in μg/mL of all the plant extracts screened for their antiplasmodial activity were as follows: M. indica (4.150), A. marmelosfruit (41.032), F. religiosa (5.265), A. indica (3.906), M. oleifera (3.906), H. suaveolens (3.906), F. racemosa (79.118), A. marmelos leaf (16.651), A. bilimbi (4.881). 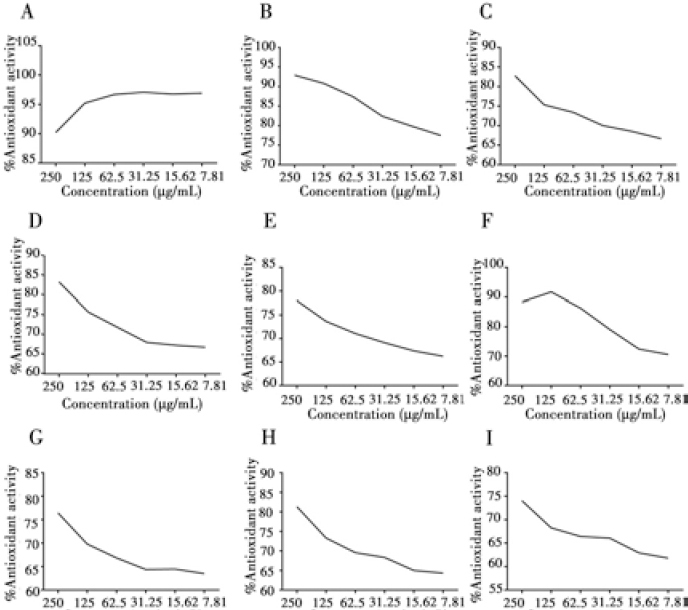 Again M. indica and H. suaveolens exhibited the maximum antioxidant activity; even at the lowest concentration of 7.81 μg. [Figure 3] shows the graph depicting the percentage antioxidant activity of all the crude extracts at varying concentrations. The effective concentration of plant extract required to scavenge the DPPH radical by 50% was calculated. The IC50 values of antioxidant activity of all the plant extracts expressedwere as follows: M. indica (2.293 μg/mL), A. marmelos fruit (2.680 μg/mL), F. religiosa (2.733 μg/mL), A. indica (2.799 μg/mL), M. oleifera (2.871 μg/mL), H. suaveolens (2.683 μg/mL), F. racemosa (3.324 μg/ mL), A. marmelos leaf (3.134 μg/mL), A. bilimbi (3.327 μg/mL). Figure 3: Percentage antioxidant activity of all crude extracts at varying concentrations. (A) M. indica; (B) A. marmelos; (C) F. religiosa; (D) A. indica; (E) M. oleifera; (F) H. suaveolens; (G) F. racemosa; (H) A. marmelos; (I) A. bilimbi. In the last decade there has been resurgence in search for new lead compounds from plants to treat malaria. However, only a few, out of 250 000 plant species, have been thoroughly investigated for their therapeutic abilities. Plant based drugs by far have proved to be very effective remedies for the prevention as well as treatment of various diseases and are known to provide the lead compound or the backbone for the various drugs currently in use. The present study is aimed at ethno-directed sampling approach for screening and identification of potential plant species for antiplasmodial activity. Among the nine plant species selected on the basis of their ethnobotanical uses, M. indica and H. suaveolens were found to be highly potential sources for isolation and/ or development of lead compounds with antiplasmodial activity. The IC50 value of artemisinin, which was used as a standard, was also found similar to that of M. indica and H. suaveolens. Interestingly, M. indica has been already reported for its antiplasmodial activity as well as antipyretic effect, which was proved by Awe et al, by demonstrating an in-vivo test of stem bark extract against Plasmodium yoelii nigeriensis in mice, while it is reported that a compound named 13 alpha-epi-dioxiabiet-8(14)-en-18-ol, isolated from petroleum ether leaf extract of H. suaveolens showed very high antiplasmodial activity, having an IC50 value of 0.1 μg/ mL. In another study, H. suaveolens ethanolic leaf extract also displayed good antiplasmodial activity against Plasmodium berghei, with 51.05% suppression. A compound named dehydroabietinol, isolated from H. suaveolens, was reported to display an IC50 value ranging between 26-27 μΜ, against chloroquine-sensitive and chloroquine-resistant strains of P. falciparum. In the present study using the crude whole plant extract, the IC50 value obtained for H. Suaveolens was 3.906 μg/mL. Identification and purification of active principle from the crude extract may lead to either reduction or increase in the IC50 value. In another study by Bagavan et al., hexane, chloroform, ethyl acetate, acetone, and methanol extracts of Citrus sinensis (peel), Leucas aspera, Ocimum sanctum, Phyllanthus acidus (leaf), Terminalia chebula (seed) were tested for their antimalarial activity against 3D7 strain of P. falciparum. The IC50 values ranged from 4.76 μg/mL to above 88.03 μg/mL. There are various reports showing a large number of plants screened for their antiplasmodial activity against P. falciparum,,,,. Dr. Duke’s Database has reported antimalarial as well as antipyretic activity of M. indica, A. marmelos, H. suaveolens and A. bilimbi. A. indica is reported to possess antipyretic effect, while M. oleifera and A. bilimbi are known to possess antimalarial property. M. oleifera is reported to possess antipyretic effect. 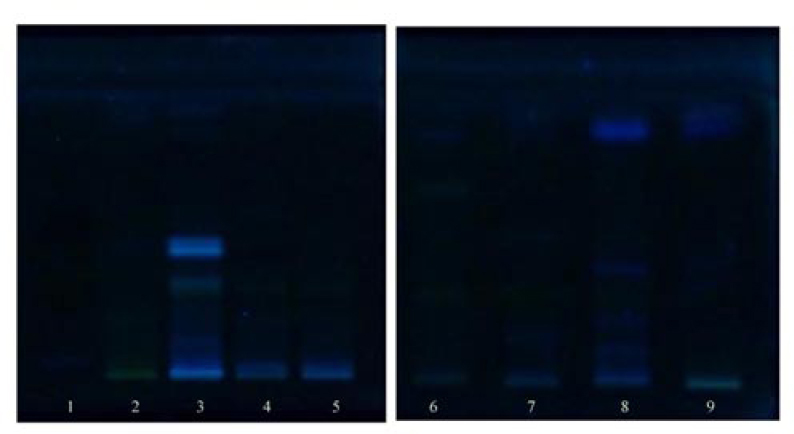 Antiplasmodial activity of the aqueous extract and ethanol extract (twig and whole plant), of M. oleifera was checked using 3D7 strain of P. falciparum. Aqueous extract demonstrated IC50 value of 43.65 μg/mL, while ethanol extract showed an IC50 value of 15.13 μg/mL. In yet another study, the crude ethanolic and n-hexane extracts of M. oleifera leaves showed a promising in-vitro antiplasmodial activity ranging from 74.7% to 95.6% inhibition of parasitaemia. Artemisia annua L. (Asteraceae) is a native to China. It was used traditionally to treat fever. Later on it was identified as an antimalarial. In 1972, artemisinin, the active component was isolated and identified by the Chinese. Artemisinin chemically is a sesquiterpene peroxide, an endoperoxide compound. From this lead compound, various derivatives were then produced,. The plants which have manifested the best antiplasmodial activity (M. indica and H. suaveolens) have triterpenoids as the major phytocomponent. It is therefore possible that the antiplasmodial activity exhibited by these plants is also probably due to the presence of these phytoconstituents. The effectiveness of a substance in inhibiting a specific biochemical or biological function is called its IC50 value. It indicates the amount of a particular drug required to inhibit a biological or biochemical process by half. Lower the IC50 value, lesser the side effects of the drug. In the present study, plant extracts of M. indica and H. suaveolens showed low IC50 values. Based on the literature survey and the results obtained in the present study, ethno-directed plant selection approach seems to have higher efficacy in identifying potential plant species with therapeutic properties, rather than the random selection approach. Plants possess a wide range of metabolites such as alkaloids, glycosides, phenols, terpenoids, flavonoids and various other such phytocomponents. These metabolites are known to be a rich source of antioxidants. In patients suffering from P. falciparum infection, there is an increase in the level of lipid peroxidation. This happens due to the release of reactive oxygen species from the infected erythrocytes. The main reason for anaemic condition in patients suffering from malaria is due to this oxidative stress. Higher the parasitaemia, higher the amount of reactive oxygen species released. The present study showed that M. indica and H. suaveolens plant extracts possess high antioxidant activity. On the other hand, A. bilimbi showed good antiplasmodial activity, but weak antioxidant activity. A drug with antimalarial as well as antioxidant property can help in checking malarial anaemia effectively. Further studies on isolation and characterization of active compounds from the selected plant species may prove to be useful. The antioxidant activity of the crude extract, we can assume, can counteract the oxidative damage caused due to the malaria parasite. Moreover the IC50 value exhibited by the crude extract of M. oleifera, A. indica and H. suaveolens, when compared with artemisinin are found to be promising. Further investigations to explore and identify the active principle/s by bioassay-guided fractionation from M. oleifera, A. indica, M. indica, H. suaveolens and A. bilimbi, are in progress. The authors are grateful to P. G. Department of Biosciences, Centre of Advanced Studies, Sardar Patel University and Department of Zoology, Biomedical Technology and Human Genetics, School of Sciences, Gujarat University, for providing the necessary facilities and requirements throughout the research. Greenwood BM, Fidock DA, Kyle DE, Kappe SHI, Alonso PL, Collins FH, et al. Malaria: progress, perils, and prospects for eradication. J Clin Invest 2008; 118(4): 1266-1276. Jinky G, Dipak C, Mukesh KK, Mithun R. Synthesis and antimalarial activity evaluation of some mannich bases of tetraoxane-phenol conjugate. Indian J Pharm Educ Res 2016; 50(4): 591-597. Rudrapal M, Chetia DPA. Synthesis, antimalarial and antibacterial activity evaluation of some new 4-aminoquonoline derivatives. Med Chem Res 2013; 22(8): 3703-3711. Warrell DA. Cerebral malaria. Schweiz Med Wochenschr 1992; 122(23): 879-886.
WHO. Malaria fact sheet: World malaria report 2015. Geneva: WHO; 2016. Sinha S, Medhi B, Sehgal R. Challenges of drug-resistant malaria. Parasite 2014; 21: 61. Fidock DA, Rosenthal PJ, Croft SL, Brun R, Nwaka S. Antimalarial drug discovery: Efficacy models for compound screening. Nat Rev Drug Discov 2004; 3(6): 509-520. Bahekar S, Kale R. Herbal plants used for the treatment of malaria- a literature review. J Pharmacogn Phytochem 2013; 1(6): 141-146. Cragg GM, Newman DJ. Natural products: A continuing source of novel drug leads. Biochim Biophys Acta - Gen Subj 2013; 1830(6): 3670-3695. Atanasov AG, Waltenberger B, Pferschy-Wenzig EM, Linder T, Wawrosch C, Uhrin P, et al. Discovery and resupply of pharmacologically active plant-derived natural products: A review. Biotechnol Adv 2016; 33(8): 1582-1614. Kaur K, Jain M, Kaur T, Jain R. Antimalarials from nature. Bioorganic Med Chem 2009; 17(9): 3229-3256. Harvey AL, Edrada-Ebel R, Quinn RJ. The re-emergence of natural products for drug discovery in the genomics era. Nat Rev Drug Discov 2015; 14(2): 111-129. Solowey E, Lichtenstein M, Sallon S, Paavilainen H, Solowey E, Lorberboum-galski H. Evaluating medicinal plants for anticancer activity. Sci World J 2014; 2014. DOI: http://dx.doi. org/10.1155/2014/721402. Dhankhar S, Ruhil S, Balhara M, Chhillar AK. Aegle marmelos (Linn.) Correa: A potential source of phytomedicine. J Med Plants Res 2011; 5(9): 1497-1507. Bero J, Frédérich M, Quetin-Leclercq J. Antimalarial compounds isolated from plants used in traditional medicine. J Pharm Pharmacol 2009; 61(11): 1401-1433. Harborne JB. Phytochemical methods. 2nd edition. Springer Netherlands: Dordrecht; 1984. Jonville MC, Kodja H, Humeau L, Fournel J, De Mol P, Cao M, et al. Screening of medicinal plants from Reunion Island for antimalarial and cytotoxic activity. J Ethnopharmacol 2008; 120(3): 382-386. Blois MS. Antioxidant determinations by the use of a stable free radical. Nature 1958; 181(4617): 1199-1200. Ghorbani A, Naghibi F, Mosaddegh M. Ethnobotany, ethnopharmacology and drug discovery. Iran J Pharm Sci 2006; 2(2): 109-118. Moloney MG. Natural products as a source for novel antibiotics. Trends Pharmacol Sci 2016; 37(8): 689-701. Tarkang PA, Franzoi KD, Lee S, Lee E, Vivarelli D, Freitas-junior L, et al. In vitro antiplasmodial activities and synergistic combinations of differential solvent extracts of the polyherbal product, Nefang. Biomed Res Int 2014; 2014(1): 835013. Awe SO, Olajide OA, Oladiran OO, Makinde JM. Antiplasmodial and antipyretic screening of Mangifera indica extract. Phyther Res 1998; 12(6): 437-438. Chukwujekwu JC, Smith P, Coombes PH, Mulholland DA, van Staden J, Chukwujekwu JC, et al. Antiplasmodial diterpenoid from the leaves of Hyptis suaveolens. J Ethnopharmacol 2005; 102(2): 295-297. Ziegler HL, Jensen TH, Christensen J, Stærk D, Hägerstrand H, Sittie AA, et al. Possible artefacts in the in vitro determination of antimalarial activity of natural products that incorporate into lipid bilayer: Apparent antiplasmodial activity of dehydroabietinol, a constituent of Hyptis suaveolens. Planta Med 2002; 68(6): 547-549. Bagavan A, Rahuman AA, Kamaraj C, Kaushik NK, Mohanakrishnan D, Sahal D. Antiplasmodial activity of botanical extracts against Plasmodium falciparum. Parasitol Res 2011; 108(5): 1099-1109. Omonhinmin AC, Dike IP, Rotimi SO. Phytochemical, cytotoxicity and antioxidant activities of five anti-malaria plants. Res J Med Plant 2015; 9(2): 81-89. Kamaraj C, Kaushik NK, Rahuman AA, Mohanakrishnan D, Bagavan A, Elango G, et al. Antimalarial activities of medicinal plants traditionally used in the villages of Dharmapuri regions of South India. J Ethnopharmacol 2012; 141(3): 796-802. Kvist LP, Christensen SB, Rasmussen HB, Mejia K, Gonzalez A. Identification and evaluation of Peruvian plants used to treat malaria and leishmaniasis. J Ethnopharmacol 2006; 106(3): 390-402. Abiodun O, Gbotosho G, Ajaiyeoba E, Happi T, Falade M, Wittlin S, et al. In vitro antiplasmodial activity and toxicity assessment of some plants from Nigerian ethnomedicine. Pharm Biol 2011; 49(1): 9-14. Pandey A, Pandey RD,Tripathi P, Gupta PP, Haider J, Singh AV, et al. Moringa oleifera Lam. (Sahijan) - A plant with a plethora of diverse therapeutic benefits: An updated retrospection. Med Aromat Plants 2012; 1(1): 1-8. Donkor AM, Oduro-Mens D, Ani E, Ankamah E, Nsiah S, Ekow Mensa D, et al. In vitro anti-plasmodial activity of aqueous and ethanolic extracts of Moringa oleifera and Phyllanthus amarus. Int J Biol Chem 2015; 9(4): 198-206. Olasehinde GI, Ayanda OI, Egwari LO, Ajayi AA, Awofeso T. In vivo antiplasmodial activity of crude ethanolic and n-hexane extracts of Moringa oleifera leaves. Int J Agric Biol 2016; 18(5): 906-910. Price R, Nosten F, Luxemburger C, ter Kuile F, Paiphun L, Price R, et al. Effects of artemisinin derivatives on malaria transmissibility. Lancet 1996; 347(9016): 1654-1658. Gamo FJ. Antimalarial drug resistance: New treatments options for Plasmodium. Drug Discov Today Technol Resist 2014; 11: 81-88. Tiwari R, Rana CS. Plant secondary metabolites: A review. Int J Eng Res Gen Sci 2015; 3(5): 661-670. Raza A, Varshney SK, ShahidM, Khan HM, Ashraf MalikM, Abbas A, et al. Lipid Peroxidation in cerebral malaria and role of antioxidants. IOSR J Pharm 2013; 3(1): 15-18.